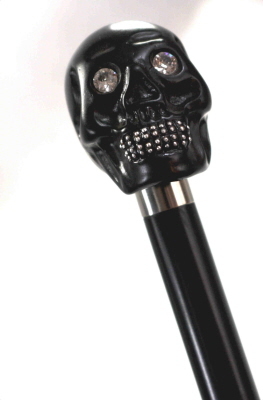 This is a very unusual cane suitable for formal use and on special occasions. 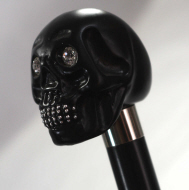 The black skull-shaped handle is set with two large Swarovski Elements in the eye sockets, giving it a compelling appearance. The teeth are highlighted with tiny metal studs and the black hardwood shaft is fitted with a smart metal collar and discreet non-slip rubber ferrule. 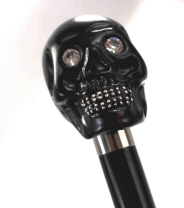 The black skull-shaped handle is set with two large Swarovski Elements in the eye sockets, giving it a compelling appearance. The teeth are highlighted with tiny metal studs and the black hardwood shaft is fitted with a smart metal collar and discreet non-slip rubber ferrule.